I thought I’d indulge in a little wedding nostalgia from the 1920s today, partly because I was wondering when the next series of Downton Abbey is due to start. (I’m guessing in the Autumn once the weather has turned and the summer of sport is over!) 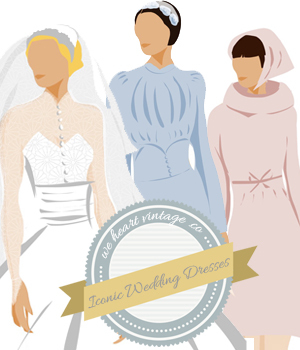 I love the styles of the 1920, these wedding dresses range from short flapper-style gowns to full length dresses, but all with a really distinctive flavour of the decade. I think my favourite is the dress below with that amazing petal-shaped hem and the groom in his very dapper top hat! Which is your favourite photo? Above: Michael Joseph Bishop (age 25) who married Patricia Foley (age 22) on 24 April 1924. I love them all .. but the best has to be the petal hemmed dress in the second photo! And those big hats in some of the other pictures are just wonderful.. but how on earth could they see where they were going!? I absolutely love that second to last photo, with the three lovely ladies and their garlands. I’ve been obsessed with the 20s lately – all the Jazz Age Lawn party photos, watching Miss Fisher’s Murder Mysteries on Netflix (if you haven’t watched it, you really should – the fashions are amazing! ), and catching up with Boardwalk Empire are all conspiring to make me want to learn to Charleston.